Let’s talk about the TSO for a second…woops, half of you just left the building 🙂 For the rest of you still here TSO stands for Technical Standard Order. It’s basically the quality and performance standards for parachutes since year 1949. I’m not gonna go through all different variation and their requirements. For most of you it’s gonna be just boring! The reason I’m doing this post is to help you understand what the numbers on your new logcarts mean. When we’ve got the new forms from KNVvL, the instruction was to write the TSO Weight and Speed for the reserve canopy. That’s the CERTIFIED MAXIMUM. Now that’s changed and we have to write the “RECOMMENDED” weight and speed, which for most manufacturer is much lower. Decelerator 120 reserve from Parachute systems is certified to 275 lbs (125 kg) and 150 knots. (275 km/h), but the recommended weight is 183 lbs and 130 knots. See the picture . 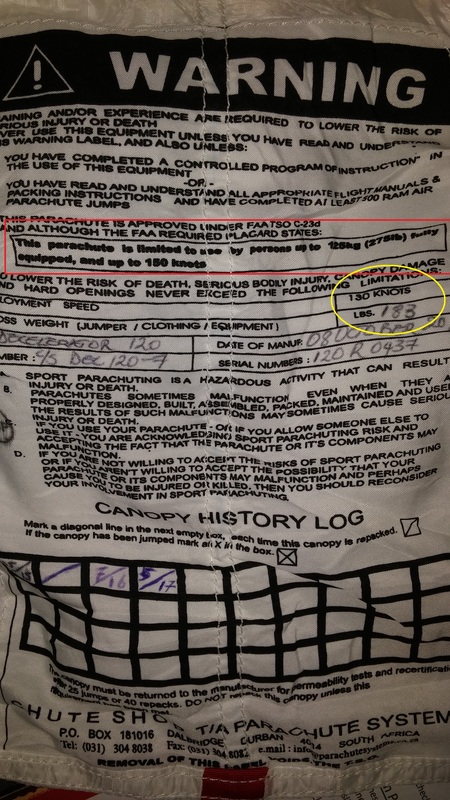 Manufacturers are doing this to pass the responsibility to the jumper if something goes wrong. I hope you all understand that while Techno 98 for example should survive the opening shock from a 100kg person, and should not fall apart, landing this reserve with that weight will not be pretty if the jumper is unconscious. The impact might be not survivable!!! We can compare this to driving on the highway. If the speed limit is 120 km/h, but it’s foggy or the road is wet, driving with that speed might not be the smartest thing to do. Just because it’s legal, doesn’t make it smart. I hope that makes it clear. If you have more questions regarding the TSO requirements, you can get in touch with me and I’ll try to answer them. AREA 47 is a professional parachute rigging company. Our mission is to provide high standard rigging to the entire parachute community. By becoming our customer, you can count on those things that make us different from the rest.